The citrus diet and the grapefruit diet suggest eating mostly citrus fruit for several days to flatten your stomach. While any diet consisting of mostly fruit is likely to be low in calories and efficient for weight-loss, no diet that restricts your nutrition to a single food group is healthy. Citrus fruits are richly nutritious. "BBC News" reported in 2004 that a study by San Diego's Scripps Clinic suggested that grapefruit is helpful for losing weight; however, the only way to lose belly fat safely and keep it off is to regularly burn more calories than you eat. Eat citrus fruits as part of a balanced breakfast. Make an orange-and-yogurt smoothie. Alternately, have half a grapefruit and a whole-wheat pancake. Modify your meals to include more fruits and vegetables. Consume less meat, grains and fats. Include citrus fruits and cruciferous vegetables for their high fiber content and bulk. Season salads and soups with lemon juice, orange juice or lime juice, instead of oil-based or cream-based marinades and dressings. This eliminates the empty calories in otherwise healthy dishes and increases your vitamin C intake instead. Cut processed foods, red meat, high-calorie snacks, white bread and sugary desserts from your regular diet. Replace them with lean proteins, such as beans and tofu; whole grain breads and pastas; brown rice; salads; and fruit for dessert. Exercise regularly. Run, walk, swim or cycle four to six days each week. Weight train or practice yoga three to four days per week. Increase the number of calories you burn to help melt fat and flatten your stomach. Talk to your doctor before changing your diet or exercise regimen. Eat at least 1,200 calories each day. Don't restrict your diet to citrus fruits alone. This is not a healthy way to lose weight. Grapefruits interfere with some prescription medications. Talk to your doctor about your medications and how they combine with grapefruit. MayoClinic.com; Grapefruit Juice: Beware...; Katherine Zeratsky, R.D. 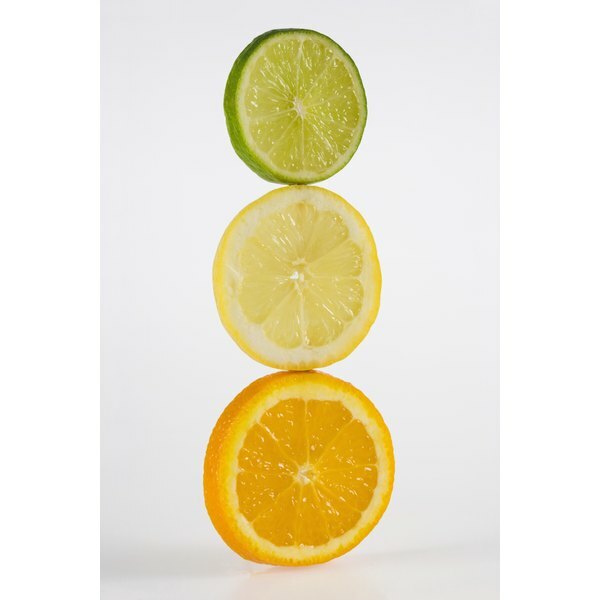 FAO.org; Nutritional and Health Benefits of Citrus Fruits; Christine Economos, et al.